Our filter mount provides the perfect entry into a professional modular filter system, particularly popular with landscape photographers as the filters are quickly changed by simply sliding in and out. The filter mount is attached to the lens beforehand via an adapter ring. 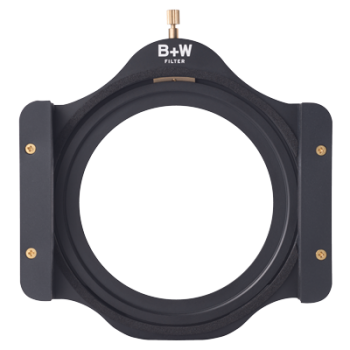 B+W supplies adapter rings with several different threads for a wide range of lens diameters. Intermediate sizes are accommodated by additional adapter rings from the B+W range. The filter channels accept square filters with an insertion size of 100 mm width with a glass thickness of 2 mm. The mount also facilitates adjustment of the filter channels in the event of any variations in thickness of the filter glass (a small screwdriver is supplied for this purpose). The mount accepts up to three square filters. In addition, a thread for filters of 86 mm diameter is available, into which a polarising filter may be inserted and adjusted, for example. A lens hood prevents the incidence of light when using strong ND filters with extremely long exposure times. Brochure "Brochure "Square Filters and Filter Holder"
Transmission Curve "ND Square Filter"